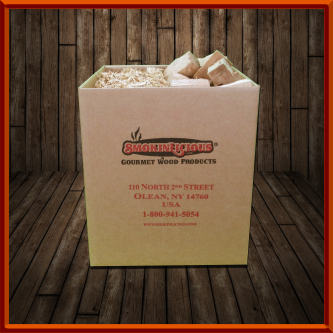 We have often been asked about the need to have both wood chips and wood chunks available during a cooking event. Questions range from when is it appropriate to use one type of product over the other, when can you use both products at the same time, and do the wood products have any other purpose other than to generate smoke? In answering these questions, it is safe to say that wood chunks and chips can be used interchangeably during smoking. If you have a cooker that will allow the use of both products, than you can add flavor via both methods: 2-3 wood chunks and a handful of wood chips. But another important use for wood chips is to generate heat. When the cooker begins to lose temperature, applying a handful or two of un-soaked wood chips to the existing charcoal will quickly raise the temperature of the cooker. Additionally, many people own more than one piece of grilling equipment. Therefore, our Combo Smoker is an easy way to keep wood product available for both the gas/propane grill as well as the charcoal/wood smoker or grill. Our Hickory chunks are a great choice! and packaged separately in boxes.